9 Works Theatrical proudly announces its forthcoming new production - THE WEDDING SINGER, a riotous yet heartwarming musical comedy based on the New Line Cinema film starring Adam Sandler and Drew Barrymore. 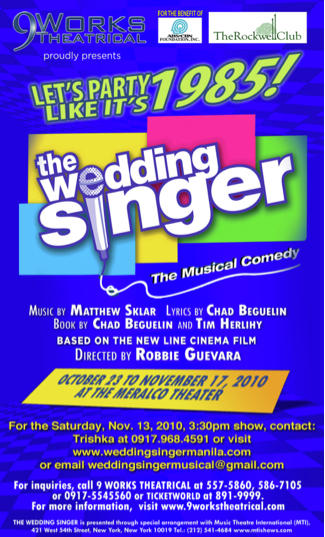 THE WEDDING SINGER is set to open at the Meralco Theater on October 23, 2010 and will run until November 17, 2010. THE WEDDING SINGER is written by Matthew Sklar, with lyrics by Chad Beguelin, and book by Chad Beguelin and Tim Herlihy. The Tony Award-nominated musical captured the hearts of audiences all over America with its mind-blowing tribute to the 80s, its hilariously written script, and songs like “Someday,” “If I Told You,” and the phenomenal hit, “Grow Old With You.” The musical-comedy is set in New Jersey circa 1985. When Robbie, a charismatic wedding singer, is dumped in the altar by his longtime girlfriend Linda, the protagonist becomes a casualty of love and plunges into the depths of dumpster-level despair. But with the help of his friend Julia, a sweet and caring waitress who is oddly engaged to a smug of a guy and Wall Street type named Glen, Robbie rediscovers why he was all about the “love” in the first place. THE WEDDING SINGER will be directed by Robbie Guevara. The Artistic Production Team includes Musical Director Rodel Colmenar conducting the Manila Philharmonic Orchestra, Choreographer Francis Matheu, Vocal Coach Onyl Torres, Scenographer Mio Infante, Lighting Designer Martin Esteva, Sound Designer Chuck Ledesma and Costume Stylist Rosanna Aranaz. The Production Team is composed of Executive Producer Santi Santamaria, Production Manager Sunshine Domine, Technical Director Paul Domine, PR and Publicity Consultant Toots Tolentino. PR Director Toff de Venecia, PR Manager Jonjon Martin, Marketing Manager Shelyn Tayanes, Stage Manager Lambert de Jesus, and Company Manager Anna Santamaria. THE WEDDING SINGER is presented through a special arrangement with Music Theatre International (MTI), 421 West 54th Street, New York, New York 10019, Tel. : (212) 541-4684. For tickets and inquiries, you may call (632) 586-7105, 557-5860, +63.917.554.5560, or visit www.9workstheatrical.com.